Early modern understandings of the human body’s functionality were closely tied to the dissections and vivisections of animals. One of the most fundamental bodily functions, the circulation of blood, was discovered by William Harvey as a direct result of these experiments (Binkley 160). The need to understand human and animal bodies reaches beyond the simple desire to comprehend anatomical function, involving additionally the search for fundamental differences between how the categories of bodies operate. By knowing the difference between how animals and humans function, humans would justify not only their treatment of animals for entertainment, but both their use and consumption. As Erica Fudge wrote, animals during this period were seen as “for human use.” The wool of the sheep, for example, was only being held on a sheep’s body through the season until it was needed by a human (Fudge 94,95). This leads to an interesting paradigm wherein animal dissections were used to better understand the functions of the human body, yet the anatomical differences found in the same dissections were used to solidify the differences between human and animal. These differences were then used to justify mistreatment, and they positioned animals as a means of entertainment or as a series of provisions, such as meat for food or pelts for clothing. 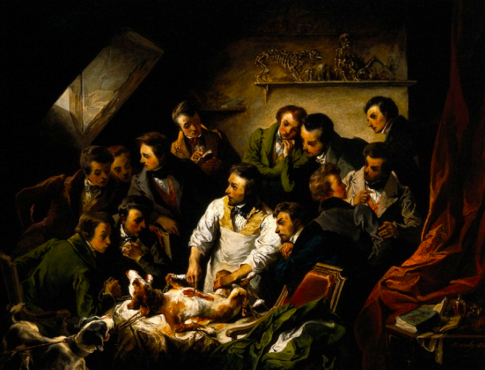 It is also of note how popular anatomical theaters became during this time, with public dissections becoming more common as a means of entertainment. This includes human dissections as well as animal. This fact serves to place human and animal corpses on the same level, as both were used to educate and entertain the audiences who would come to watch a dissection. Some anatomical theaters presentied the public dissections more as forms of natural art than a means of scientifically attempting to understand the processes behind life (Findlen 278). The use of human bodies as a means of entertainment much like those of other animals would likely have raised questions of dominance within the audiences watching the dissections take place. These theaters provided the audiences of the time with the ability to see the internals parts of the body, and hear the theories of the time of how the pieces operated. Living animal subjects would also allow the audiences to see the organs in action, and help them not only understand the processes of their own bodies, the bodies of the living organisms around them. Audiences could see, first hand, the differences and similarities of the internal organs of humans and other animals, likely answering, and raising many questions of the difference between Homo sapiens and Animalia. Joseph is a junior and creative writing major at Ball State University. He finds scientific movements during the early modern period to be particularly interesting. Binkley, Pauline E. “William Harvey, M.D. the Discoverer of the Circulation of the Blood.” The Illustrated Magazine of Art 1.3 (1853): 159-61. JSTOR. Web. 30 April. 2014. Findlen, Paula. “Anatomy Theaters, Botanical Gardens, and Natural History Collections.” The Cambridge History of Science Volume 3: Early Modern Science. Ed. Lorraine Daston and Katharine Park. New York: Cambridge University Press, 2006. 272-280. Print. Fudge, Erica. Perceiving Animals: Humans and Beasts in Early Modern English Culture. Chicago: University of Illinois Press, 2002. Print. Early anatomical theatres were temporary establishments: wooden amphitheaters where crowds could watch the dissections take place. Even when theatres became more established, permanent structures, the process and methods of anatomy were crude in the sense that they did not focus on the accuracy of the anatomy of the human body. The first public dissections were conducted by an assistant, while the professor of anatomy sat high above, reading from an aged text, all of which was performed in front of an audience. Sarton provides an excellent description when he writes, “The average professor had never done any dissection of his own and despised that kind of work [….] if the professor was of the true scholastic type (and he often was), he would have more confidence in his text than in the dissected body” (173-174). This reveals the state of mind of this time period, as anatomical professors were not concerned with progressing the discourse of anatomical discoveries, but rather reiterating established concepts, regardless of the accuracy. However, there still existed true anatomists who preferred to personally perform the dissections, such as Andreas Vesalius, who took a visceral approach to anatomy, and conducted his dissections himself, believing the physical body instead of the preceding texts. He viewed his practice as living art, involving the audience with the process and bringing the reality of the dissection much closer. The anatomist “exploited contemporary theatrical techniques, diminishing the distance between the lecturer and the audience by allowing the audience to handle the organs as he removed them from the body” (Findlen 276). This was a peak in the dawn of modern anatomy. Anatomists moved away from the distanced scholarly professor, who trusted solely the words of the textbook over true living evidence. In addition to bringing about a newfound critical development of anatomy, Vesalius also helped pioneer a shift in artistic portrayal of anatomical discoveries. He published a book in 1543, titled The Fabric of the Human Body, which contained very detailed prints of his explorations and discoveries. This collaboration between science and art helped further the osmosis of ideas and concepts. It had reached a point when, “men of science had been gradually trained not to be satisfied with words; they wanted to see things, to see them clearly…in their wholeness and surroundings” (Sarton 177). This marks the definite progression in anatomical practice, and subsequently the accuracy in which it was captured and portrayed. It was more visceral and progressive, with discoveries in accordance with detailed images. It is also interesting to note the work of work of Charles Estienne, or Carolus Stephanus, a French artist who published several books in medicine, agriculture, and classics. Most notable to this article were his books containing prints of staged anatomized bodies. Kemp writes, “The figures – whether men acting out heroic dramas in grand settings such as all’antica landscapes, or women anatomized in bedrooms – correspond in tone to the author’s definition of the nobility and grandeur of the human estate in relation to God’s creation” (196). When viewed through this perspective, it’s interesting to see how art was able to transcend the status of the human body, still relating them to “God’s creation,” regardless that the soul was gone, thus making them nothing more than cold machines. The provided image is an illustration by Stephaus titled, “De dissectione partium corporis humani,” details a pregnant woman with her torso open in dissection. When analyzed through Kemp’s viewpoint, the image inherits an almost celestial quality, as the woman is preserved in an act of perpetuating human life, and perpetuating God’s creation through the human body. As anatomy became more accurate, and artistic renderings became more realistic, art still possessed the ability to immortalize the body in a state of beautification and transcendence. Man was able to actualize his corporeal self, and preserve these discoveries through art, while still allowing the human body to remain connected to God and divine above other animals. Jared Lynch is a senior at Ball State University, where he is majoring in English with a focus in creative writing. He was recently published in the inaugural issue of the Digital Literature Review, where he also served as head of the Design team. Image: Estienne, Charles. De dissectione partium corporis humani. 1545. Woodcut. “Gallery: Dream Anatomy.” U.S. National Library of Medicine. Web. 30 April 2014. Kemp, Martin. “Style and non-style in anatomical illustration: From Renaissance Humanism to Henry Gray.”Journal of Anatomy 216 (2010): 192-208. Online. Sarton, George. Six Wings: Men of Science in the Renaissance. Bloomington: Indiana University Press, 1957. Print. For some, the Renaissance is a time of incredible intellectual leaps and bounds; and in many regards it was. Yet there were also aspects of that time that we can consider primitive. Numerous examples exist in which early modern people formulated scientific and social ideas despite what contrary evidence lay in front of their faces. This is the case with contemporary approaches to science, prior to the popular emergence of methodical scientific experimentation. Methodical experimentation was still a largely new idea (Binkley). The slow embrace of the scientific method, I argue, allowed dominant white, anglican, male groups to strategically ignore evidence of racial and gendered equality in order to position themselves as a higher form of humanity. One of the strongest incidences of this phenomenon exists in Shakespeare’s The Tempest. All evidence within the text points to the fact that Ariel should be much more dominate than Prospero. Ariel was on the Island well before Prospero, and Ariel has magical powers that seem much more powerful than Prospero’s insofar as Prospero relies upon them for his dominance. Ariel causes much of the pandemonium in the play, afterall. Prospero’s (and the audience’s) clear disregard for those in submissive positions shows much about Renaissance mentalities. Even if all evidence points to Ariel being of at least equal or more power, the white male is the established dominant figure. Similarly, the relationship between Prospero and Caliban shows a warped view of humanity. Caliban, like Ariel, predated Prospero on the island. He was capable of speech, forethought, and reading even before his Western education at the hands of Miranda. With all of these traits stacked up to affirm his humanness and equality to Prospero, how could he still be considered lesser than Prospero? This is another example of how a Renaissance mindset was not to consider the evidence first, but to reinforce previous beliefs about humanity that were based in self-invested tradition. How else do we see this ignorance towards evidence relating to humanness in the Renaissance? People’s perception of animals also exemplifies the ignoring of hard evidence in order to establish dominance. 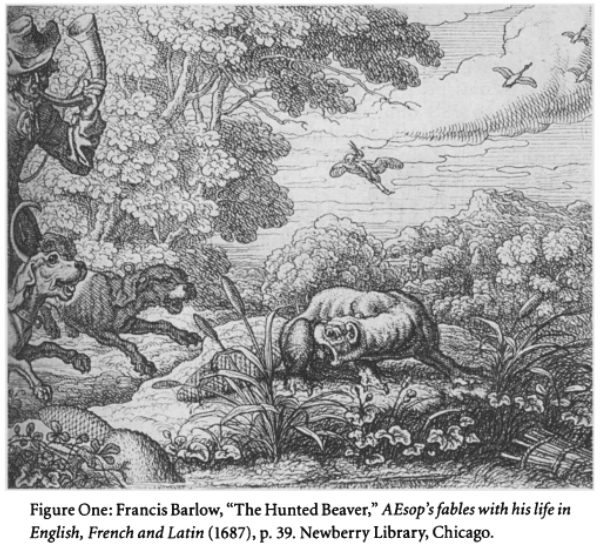 In an article by Katherine Acheson, published in Journal for Early Modern Cultural Studies, a Renaissance illustration of Aesop’s Fables reveals a lot about how humans relate to animals. The image is an illustration by Francis Barlow of the story “The Hunted Beaver” (one of the fables) from 1687 (Acheson 36). We see in the image that the beaver has only a few specific characteristics of a beaver. It resembles a generic water rodent such as an otter or ferret, or even a dog. This ambiguous anatomy shows how animals were deprived of that which made them valuable and gives humans a pass to dominate them. Renaissance illustrators ignored the evidence of a beaver’s specific and unique anatomy. As long as these unique qualities were ignored animals could be exploited. A final example could be mankind’s reliance on animals to survive. Erica Fudge takes a look at how it is that humans could rely so much on animal products, such as wool without acknowledging the animal as having value. How can humans separate themselves from animals when they rely so heavily on them? To get even deeper into the matter, what does it mean for a human when they have to rely on an animal’s skin because human skin is not enough (Fudge np). Gus is a sophomore studying English Education at Ball State University, and he hopes teach after graduation. His favorite piece of Renaissance literature is Shakespeare’s The Tempest. When he’s not immersed in British Literature, he enjoys playing basketball and running. ​IMAGE in Acheson, Katherine. “THE PICTURE OF NATURE: Seventeenth-Century English Aesop’s Fables.” Journal for Early Modern Cultural Studies 9.2 (2009): 25-50. JSTOR. Web. 16 Feb. 2014. <http://www.jstor.org/stable/20798268>. ​Binkley, Pauline E. “William Harvey, M.D. the Discoverer of the Circulation of the Blood.” The Illustrated Magazine of Art 1.3 (1853): 159-61. JSTOR. Web. 23 Feb. 2014. <http://www.jstor.org/stable/20537931&gt;. Fudge, Erica. “Renaissance animal things.” New Formations 76. 2012: 86+. Literature Resource Center. Web. 27 Feb. 2014. By Gus G., Rebecca H., Jared L., Joe Z. Throughout the semester, we researched the intersecting development of realism in science and art during the English Renaissance. Specifically, we focused attention to how anatomical dissections caused a shift toward more realistic portrayals of human and animal anatomy in artistic texts. 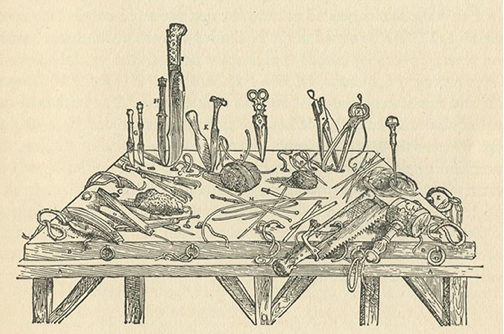 The Renaissance saw the rise of anatomical theaters, which indicated an increased interest in methodological science. Prior to this time, anatomy was theoretical in nature, insofar as professors studying the body had more confidence in their books than in the physical evidence before them. Even if a physical dissected body differed from the text, professors privileged images found in their books over the dissected evidence. Thus, the first public dissections were conducted in this manner: a professor of anatomy sat high above, reading from an aged text, while below an assistant performed the physical dissection, all of which was conducted in front of an audience. The influential scientist Francis Bacon pioneered the scientific method that influenced later research in the period–and this method shaped continued inquiry today. Following in Bacon’s footsteps, William Harvey, using the same scientific method, discovered that blood circulates through the body. Prior to this moment, no scientists embraced the idea that blood left the heart and then circulated back . These discoveries challenged commonly held beliefs about the connection between animals and humans. Similarities between animals and humans led scholars to doubt the superiority of humans. 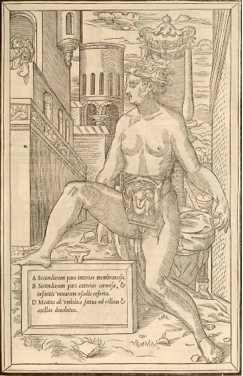 During the English Renaissance, curiosity about anatomy led to a greater interest in more realistic portrayals of anatomy in methodological science and paintings. Previously, illustrators were significantly less concerned with an accurate representation of animal anatomy. 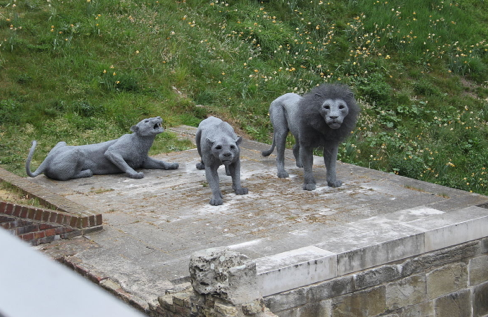 The representations were more allegorical and less about realistically portraying the actual animal. For example, illustrations of Aesop’s fables might depict a beaver as being indistinguishable from a medium sized dog. The Renaissance saw a rise in accurate artistic representations of both human and animal anatomy. The English Renaissance reveals a significant change in approaches to anatomy and artistic realism. Science changed from a theoretical science to a more methodological process. The ideas of Francis Bacon became the standard for researchers who used his scientific method to challenge common myths (Fudge 92). In the Baconian way of thinking, “tangible proof becomes central and the methods of experimentation are used to avoid the potential failings of the human mind acting alone” (Fudge 92). Experiments became accepted as factual evidence more than popular beliefs. A clear example of this move toward actuary science and representation is the image of “The Hunted Beaver”. Prior to the Renaissance, images of animals were not always anatomically correct. This image demonstrates the changes the Renaissance brought to the artistic depiction of beavers. Beavers were commonly depicted as dogs, but this image shows the shift toward realism in the visible difference between the dogs and beaver (Acheson 36). This illustration shows the shorter legs and tail that differentiates the beaver from the dogs. Another indicator of the move toward realism is the presence of water in the picture: the natural habitat of beavers (Acheson 36). Previous illustrations of Aesop’s fables depicted the animals in androgynous scenes. The move toward artistic realism was facilitated by anatomical discoveries. The story behind the image demonstrates the importance of anatomical knowledge. While Aesop’s fables were written previous to the Renaissance, they were still hunted and the subjects of poetry and paintings. Beavers were hunted for the medicinal purposes of their testicles and the fable claimed that beavers would bite off their testicles to save their lives (Acheson 33-34). During the Renaissance, beavers were hunted for their testicles that contained the castoreum used as a painkiller. In 1688, Claude Perrault’s journal shows the impossibility of a beaver biting off its testicles. Perrault describes the dissection of a beaver in which it was discovered, “the testicles of the Castor are concealed in the Groins” (Perrault 87). There were “four great pouches fixed underneath the Os Pubis,” two of which were sacs for holding the castoreum (Perrault 86). Using the scientific method, scientists realized it was impossible for beavers to bite off their testicles because they were under the skin and, furthermore; castoreum did not come from the testicle, but separate sacs. This discovery challenged what Early Modern people believed about beavers. In the fable, the beaver knows why he is being hunted and knows what to do to survive. Beavers were given human reasoning, and the lines between human and animal were blurred. Learning the anatomy of beavers gave humans the power of understanding and the perceived capabilities of beavers were no longer believed. Francis Bacon believed, “[h]uman knowledge and human power meet in one,” and the new knowledge about beavers returned the ability to act on danger back to humans (Fudge 93). Thus, anatomical knowledge changed people’s perceptions of beavers and how they were depicted. Rebecca is a junior studying English Literature at Ball State University. Through this performing humanity project, she has learned how interest in animal and human relations spurred science and art movements. Seventeenth-Century English Aesop’s Fables”. JSTOR. Web. 1 May 2014. Acheson, Katherine. “THE PICTURE OF NATURE: Seventeenth-Century English Aesop’s Fables.” Journal for Early Modern Cultural Studies 9.2 (2009): 25-50. JSTOR. Web. 1 May. 2014. <http://www.jstor.org/stable/20798268>. Fudge, Erica. 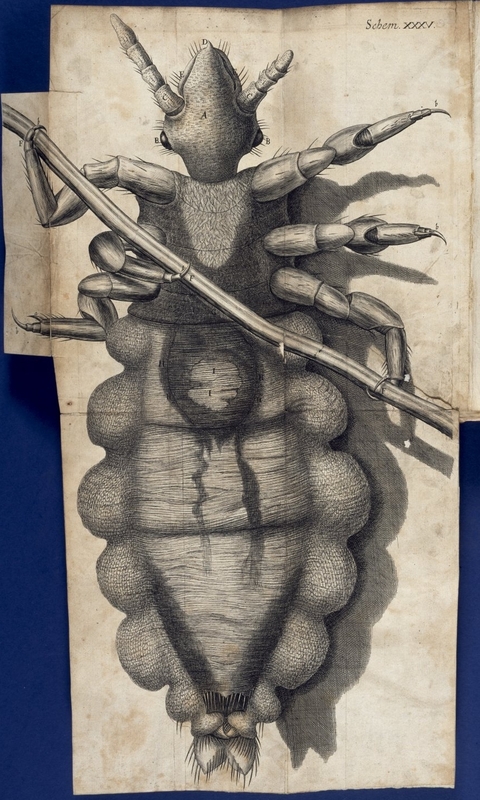 “Calling Creatures by their True Names: Bacon, The New Science and the Beast in Man.” At the Borders of the Human: Beasts, Bodies and Natural Philosophy in the Early Modern Period. Eds. Erica Fudge, Ruth Gilbert, Susan Wiseman. Basingstoke: Macmillan (1999): 91-109. Perrault, Claude. 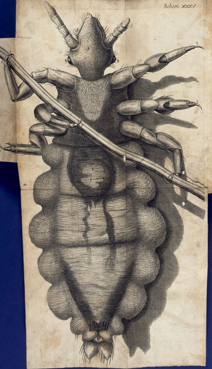 “Memoir’s for a Natural History of Animals: Containing the Anatomical Descriptions of Several Creatures Dissected by the Royal Academy of Sciences at Paris”. Science and Technology, (2011): 83-90. University of Wisconsin Digital Collections. Web. 1 May 2014. <http://digital.library.wisc.edu/1711.dl/HistSciTech.Perrault>. 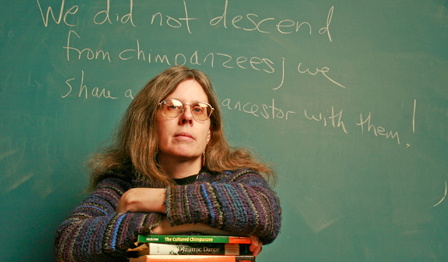 This month, Performing Humanity has the exciting opportunity to feature our editor’s conversation with Dr. Barbara King, author of The Dynamic Dance: Nonvocal Communication in African Great Apes (2004), Being With Animals: Why We Are Obsessed With the Furry, Scaly, Feathered Creatures Who Populate Our World (2010) and the recently released How Animals Grieve (2013). The topic du jour? Animals, emotions, and how sentient beings grieve. Miranda Nesler: Your recently released book has received attention from both academic and non-specialist communities, and we’re thrilled to be able to provide the blog readers with a insight into its creation. Looking backward, when and where did your interest in animal emotion originate? Barbara King: For years, I studied communication and cognition in monkeys and apes by observing the day-to-day primate encounters that unfolded before my eyes. With the great apes especially—chimpanzees, bonobos, gorillas, and orangutans—I couldn’t help but realize that I was seeing not only savvy strategists, but also sentient beings who very much felt their lives. Gradually, the more I read and became focused also on issues of animal welfare, the more I realized that it’s not just our closest living relatives but also many mammals and birds who feel and express emotions. I was hooked. MN: Among the vast emotions you observed, what led you to focus ultimately on grief and mourning? BK: I think there are two quite different answers here. For my previous two books, my research included investigations into the evolution of human burial practices. In digesting archaeological material, I began to notice reports of humans buried right alongside animals—for example, as long ago as 8000 years, a man was interred with a lamb in Turkey. From there, because I am used to thinking in an evolutionary framework, the next question emerged naturally: How do nonhuman animals grieve and mourn? I know already about elephants’ emotional responses to death, but once I began the research, I was stunned at how much additional information I found. There’s a more personal answer, too. Like many people around my age, I’m involved with caring for an elderly parent with physical troubles and some degree of dementia. Though by no means unusual, this tilting of the world wherein one becomes parent to the parent generates an experience ripe for a sort of anticipatory mourning. That very entangled mix of love and sadness is, I think, the core subject of my book. MN: It’s interesting that, as scholars, we’re encouraged at times to deny the subjective emotions that lead us to our work. And yet, as in this case, it’s what leads us to crucial ethical and existential contributions. It’s almost as though “emotion” makes us more animal—less “rational human”—something I hope we can discuss more! On the academic side of your work, what forms of research and field-work go into a project like this one? BK: My primary sources were the peer-reviewed scientific literature; interviews with people who are acute observers of animals, whether in the wild, sanctuaries, zoos, farms, or homes; and my own observations of animals ranging from primates to our household’s (many) rescued housecats. For several years, I concentrated on primary research and academic writing, and I have now taken a turn, a well-loved and exciting turn, towards writing about animals and anthropology for general audiences rather than academic ones. I do hope, though, there is overlap. MN: It’s an issue so relevant to both audiences. But this approach is also potentially more overtly personal than work targeted to traditionally academic or specialized readers. When taking this approach to writing and when dealing directly in research with human and animal subjects, does it ever become difficult to maintain objectivity or avoid emotional involvement in the study? To what degree is objectivity an aim or something that actually undercuts the project? BK: When working on the book, I kept in mind what I tell my students: If you have a favored hypothesis, or a bias toward some phenomenon you may expect to find during research, redouble your efforts to scrutinize critically how you handle and interpret the evidence you gather. For me, this meant working hard on each case as it came up and trying to think up and assess alternative explanations for animal grief and mourning. And sometimes I do embrace those alternative explanations. I wanted to use definitions and criteria that allow me to walk a line: rigorously applying standards to candidate examples of animal grief and mourning while recognizing what (some) animals themselves convey to us: that they feel their lives deeply and express their emotions accordingly. So, while I never wanted to avoid emotional involvement with the material—I love and respect animals too much for that to be either possible or desirable—I did want to be rigorous. In today’s animal-behavior science, part of being rigorous is to understand the degree of individual variation within animal species. In the first place, I would be surprised if beetles, snakes, and frogs—they are animals too!—are capable of mourning. But in the second place, in species where animals may show significant mourning, ranging from elephants and dolphins to dogs and ducks, it’s a matter of personality, individual social history, and the relationship of the survivor to the one who has died. Some animals are only curious, or indifferent, when a companion dies. MN: It’s interesting to consider the range of intensity or expression that can occur not only among species but within them. What significant overlaps or distinctions do you see in the way that human grief compares to domesticated and non-domesticated animals, respectively? And could you say a bit more about what differences you observe between those animal groups? BK: One chapter in my book is called “Writing Grief.” In it, I explore some grief memoirs I’ve read, none of which affected me more deeply than C.S. Lewis’s A Grief Observed (1961). In acute anguish, Lewis describes the process by which his beloved memories of his wife gradually begin to dim after her death. As I write in that chapter, “In grief’s grasp, he relentlessly revisits the past and anticipates the future.” I know that sometimes, nonhuman animals do revisit the past and anticipate the future, but we humans do this in grief to an unparalleled extent. Our keen awareness of the fact that those we love, and we ourselves, will die, is a novel evolutionary development, I think. Human grief is at times global. We have all found ourselves struck through with sorrow at a stranger’s death, or the loss of strangers in large numbers. We may learn of lives lost through the media or feel the impact most fully while visiting a mass memorial in Berlin, Hiroshima, or Manhattan. Still, there are some overlaps—and many unknowns—even with these distinctions. I fiercely feel that we should not head too far in the direction of avowed human uniqueness. The study of animal grief is nascent, and we have more questions than answers. This includes our knowledge about animal memory and generalized animal mourning. Some questions may be answered in the future with keen observation, whereas others may be unanswerable within the bounds of science. Elephant babies who witnessed the death of their families at the hands of poachers suffer distressed sleep and sometimes nightmares. Are they dreaming memories of their loved ones? Wild elephants may gently manipulate and caress the bleached bones of other elephants. Sometimes the bones are of kin, but not always. Do elephants mourn strangers? One area that interests me is that with domesticated species such as horses, dogs, and cats, there seems a heightened opportunity for cross-species mourning: animals who mourn us, just as we mourn them. While I am out in Yellowstone National Park observing the majestic bison, I don’t hold any illusion that the bison care much about me or would have any emotion for me—which is as it should be! They are wild animals concerned with their own lives. MN: Do you see important social or ethical implications emerging from such comparisons? 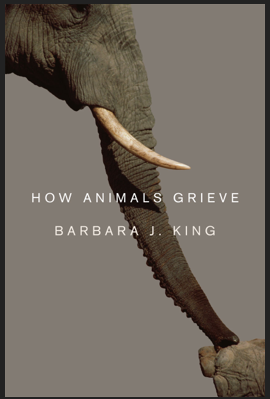 BK: The very point of writing this book for me is to ask all of us collectively to think hard about the choices we make when it comes to treatment of other animals. I’ve been an animal lover forever and a long-time advocate for primates such as chimpanzees who are confined in unspeakable conditions in biomedical laboratories; but to be honest, it’s only been in the last 5-10 years that I’ve educated myself fully about the effects on so many animals of our willingness to use them egregiously for our own purposes. Five or so years ago, I would’ve gone to Sea World to watch captive, performing marine mammals without a second thought; and back then I was eating chickens and turkeys (though not cows, pigs, and lambs). Dolphins may grieve their losses, including when they are separated from their loved ones; cow moms may grieve when their calves are taken away for slaughter. To me, the knowledge that so many animals love and grieve brings more urgency to issues of animal welfare. Admittedly, at the same time, animals who don’t love and grieve also need our attention. MN: This is an issue of debate across history—and something that Performing Humanity has tried to emphasize by connecting past and present debates. To what degree do you see historical artistic, literary, or legal representations of animals acknowledging or denying their ability to grieve? Did any such texts shape your study? BK: To Marc Bekoff, I send extreme credit and respect. Marc is an animal behaviorist and author of books including The Emotional Lives of Animals (2008) and (with Jessica Pierce) Wild Justice (2010). His writings illuminate the lives of animals. He cuts through inflated claims of human cognitive and emotional uniqueness and, just as we discussed above, does so with a primary goal of working for animals and their welfare, of awakening our responsibility to do this now and not later. Marc’s work has significantly influenced my own writing and activism. I could mention many other works—in anthropology, the writings of Tim Ingold and Eduardo Kohn; the entire Animal Series (2004-2012) from Reaktion Books, ranging from Ape to Frog to Mosquito, all of which I have reviewed for the Times Literary Supplement; and books like Andrew Westoll’s The Chimps of Fauna Sanctuary (2011). It’s not so much that these volumes dwell on grief per se, as that they open up a wide space to think openly about animals, animal lives, and what animal lives mean in their own right apart from human concerns. MN: Earlier, we discussed that your work (like so much quality scholarship) is also personal. Is there any particularly important moment that occurred during the project that you can share with readers to illustrate this? BK: Six weeks after the book came out, a bolt out of the blue hit my family and me. I was diagnosed with a rare and aggressive form of uterine cancer. After a 6-hour surgery done in May, and 6 months yet to come of chemotherapy and radiation, my prognosis should be good. This sudden entry into a serious medical situation has left me thinking about people around the world who face similar calamities with far fewer medical and financial resources available than I have. What does all this have to do with animal grief? At some visceral level, I feel the answer is… everything. How Animals Grieve is about what it is to be alive, thinking, feeling, and loving. So many of us animals, human and nonhuman, do those things, and we as a result may also grieve. Somehow, and I very much recognize how lucky I am in my loving family and friends, the resources available to me, and indeed my prognosis, all this made me feel even more connected to the animal stories in the book. MN: Barbara, I can’t say how glad I am we had the chance to talk. Thank you for taking the time to share with me and the readers. Recent Discussion of Dr. King’s Work also appears at NPR, the NY Post, and TIME Magazine. You can follow her on Twitter @bjkingape.